After we went relentlessly downscale with our last PCH choice (in which the POS Mustang and basket-case Camaro came out neck-and-neck in the poll, some of you have demanded that we include a "No" vote option in the poll. That ain't happening, folks; Hell doesn't work that way. Anyway, it's time to leave North America and cross the Atlantic, where we can get a taste of the kind of knuckle-bustin' eternity faced by our counterparts in the United Kingdom. Just to make it harder, we're choosing British cars, to lull you into the (no doubt incorrect) belief that parts will be easy to find over there. Project Car Hell: Camaro or Mustang? We know all about the dreadful-yet-oddly-lovable Reliant Robin over here, and some of us even dig the Reliant Kitten. Real aficionados of hellish car projects also know that the Israeli-made Sabra and Sussita were Reliant-based machines as well. But how about your very own Reliant Scimitar? It's a decent-looking car, powered by what appears to be the same Ford V6 used in the Capri, and here's an intact one pretty cheap. Imagine what you'd have if you stuffed absurd amounts of boost into that engine (well, aside from shattered drivetrain parts and the grunching sound of rusty steel collapsing, that is). Of course, first you'd need to fix all the stuff that's wrong with it, and we're guessing that's quite a list... but the seller has health problems- and other cars- so it's time to swoop in and steal this deal! But the Scimitar is just too flashy for some of us, too obvious. 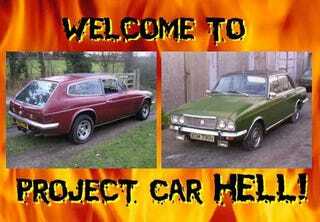 Some of us like our hellish projects to be practical 4-door saloons with familial connections to about ten million different Hillman/Rootes-based models. For you, we have this lovely Humber Sceptre, also on eBay UK with no reserve. Talk about heritage- the Sceptre is related to everything from the Hillman Minx to the Iranian-made Paykan! Don't go harshing our mellow with talk about the horrid build quality of 70s Rootes products, now, because your magical wrenching skills will have this Humber burning up the roads... well, someday. The seller admits right up front that it needs some work, but it's got only 28,000 miles! What could go wrong?